Speaker of the House Paul Ryan (R-Wis.) is in the difficult position of leading and unifying the Republican Party, while being one of the most vocal opponents to the party’s presidential presumptive nominee, Donald Trump. In an NBC interview with Chuck Todd for “Meet the Press”—which airs on Sunday, June 19—Ryan says that Republicans should follow their “conscience” when it comes to the question of endorsing Donald Trump. “The last thing I would do is tell anybody to do something that’s contrary to their conscience,” he said. But Ryan did say that he feels he needs to support the nominee as Speaker of the House in order to get a Republican President elected in November. “I feel as a responsibility, institutionally, as the Speaker of the House, that I should not be leading some chasm in the middle of our party. Because you know what I know that’ll do? That’ll definitely knock us out of the White House,” he said. The following are the milestones of Ryan’s reactions in public to Donald Trump over the last seven months, which culminated in the endorsement of Trump. Ryan, despite his criticisms, has maintained his position. While Ryan’s support for Donald Trump has evolved from denouncement to endorsement, he has made it clear that the tension between institutional responsibility and personal morality has remained a constant. Speaker Ryan, in his interview with Scott Pelley on “60 Minutes” that aired on Nov. 15, broke with Trump over the proposal, suggesting that it would never pass through the House. Scott Pelley: I take it you don’t advocate rounding up 11 million illegal immigrants and deporting them. Scott Pelley: That’s not going to happen while you’re speaker of the House. 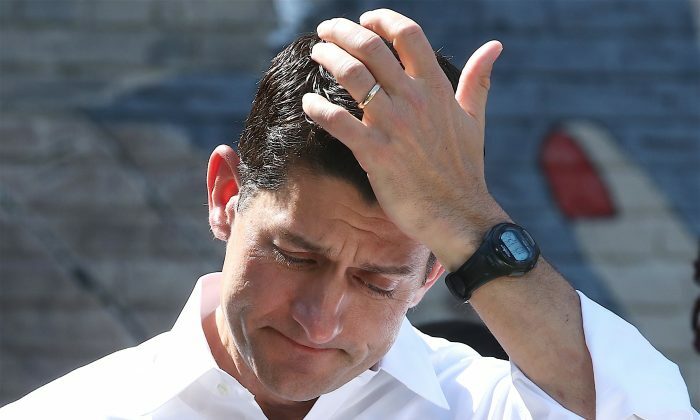 Paul Ryan: I can’t imagine how it could happen. So no. Donald Trump proposed a temporary ban on Muslims entering the United States in the wake of the Paris terrorist attack. Trump was not yet the presumptive nominee, nor had the primary season begun. He had, however, at that point been leading in the polls for four months. One of the first Republican dissenters of the proposal was Ryan, who noted during a press conference on Dec. 8—only one day after Trump made the proposal—that he does not normally comment on presidential races, but would make an exception in this case. On Super Tuesday, March 1, Ryan reacted to an interview with Trump in which the candidate refused to disavow the support of former KKK Grand Wizard David Duke. “If a person wants to be the nominee of the party, there can be no evasion and no games. They must reject any group or cause that is built on bigotry. Donald Trump went from being one of the Republican candidates to become the presumptive nominee of the Republican party after winning the state primary in Indiana on March 4, effectively putting Ted Cruz and John Kasich out of the race. However, Ryan was not ready to support Trump at the time. “I think what a lot of Republicans want to see is that we have a standard-bearer that bears our standards,” he said stressing unity. A week later, Ryan met with Trump, and said in a press conference on May 12 he felt encouraged by the meeting, but did not endorse him. About one month after saying he wasn’t ready to support Trump, Ryan wrote an op-ed in his local Wisconsin paper where he endorsed the presumptive nominee. In the endorsement, he noted his differences with Trump but stated that he would work better with Trump than with Democratic nominee Hillary Clinton. “It’s no secret that he and I have our differences. I won’t pretend otherwise. And when I feel the need to, I’ll continue to speak my mind. But the reality is, on the issues that make up our agenda, we have more common ground than disagreement. “Claiming a person can’t do their job because of their race is sort of like the textbook definition of a racist comment,” Ryan said, maintaining that this was not going to affect his endorsement of Trump. “I think if we go into the fall as a divided party, we are doomed to lose,” Ryan said. Following the terror attack in a nightclub in Orlando, Florida, that killed 49 people, Trump renewed his proposal to ban all Muslim immigrants from entering the United States. Speaker Ryan reiterated his position opposing the proposed ban. Instead, Ryan called for “a security test, not a religious test” for immigrants.